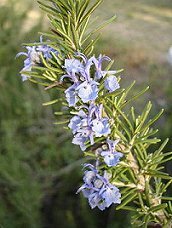 Rosemary is a lovely evergreen herb with needle-like leaves and beautiful blue flowers, that blossom from March to May. It is a known medicinal plant with a great number of therapeutic properties. Usually, rosemary leaves and flowers are used for preparing various therapeutic teas and tinctures. It has excellent tonic properties, stimulates mental activities and has other important curative effects, including stimulating hair re-growth. Rosemary and rosemary oil are known for their properties to stimulate blood flow, that is why they are considered to be effective herbal remedies for hair re-growth. Using this natural treatment for hair loss helps not only to stop thinning hair and slow down hair loss, but also to nourish hair follicles and improve hair quality. There are many ways of using this natural treatment for hair loss. In particular, one can use an easy rosemary infusion as an effective hair rinse after regular shampoo washing. Also, to enjoy the benefits of rosemary for your hair, you can simply add some 100% natural rosemary extract or dried rosemary to your shampoo, or prepare a special home-made tonic for your hair. Take some dried rosemary leaves, put them into a medium size glass or stainless steel pot, then add some grapeseed oil as much as it it enough to cover the leaves. Put the pot into a large pot of water and let it boil for about 3 hours on a slow fire, then strain the oil and let it coll down overnight. Then, massage the oil into your scalp, keep for several minutes and wash away with your usual shampoo.